COMMENTS:        This trigger occurred at longitude,latitude = 179.52,8.55 [deg]. COMMENTS:        NOTE: This BAT event is temporally(5.0<100sec) coincident with the INTEGRAL_SPIACS event (trignum=7353). COMMENTS:       INTEGRAL SPI_ACS GRB Trigger. COMMENTS:        The XRT position is 1.31 arcmin from the BAT position. COMMENTS:        The object found at this position is either a very bright burst or a cosmic ray hit. COMMENTS:        The GRB Position came from the XRT Position Command. COMMENTS:        The UVOT position is 7.6 arcsec from the XRT position. Dec(J2000) = -07d 04' 02"
with an uncertainty of 3 arcmin (radius, 90% containment, including systematic uncertainty). The BAT light curve shows a large FRED-like peak structure with a duration of about 100 sec. The peak count rate was ~8100 counts/sec (15-350 keV), at ~16 sec after the trigger. Dec(J2000) = -07d 02' 56.0"
with an uncertainty of 4.7 arcseconds (radius, 90% containment). This location is 77 arcseconds from the BAT onboard position, within the BAT error circle. No event data are yet available to determine the column density using X-ray spectroscopy. The initial flux in the 2.5 s image was 1.29e-08 erg cm^-2 s^-1 (0.2-10 keV). with a 90%-confidence error radius of about 0.61 arc sec. This position is 7.5 arc sec. from the center of the XRT error circle. The estimated magnitude is 13.88 with a 1-sigma error of about 0.14. No correction has been made for the expected extinction corresponding to E(B-V) of 0.11. MASTER II robotic telescope (MASTER-Net: http://observ.pereplet.ru) located in Blagoveschensk was pointed to the GRB160131.35 5180 sec after notice time and 5180 sec after trigger time at 2016-01-31 09:46:52 UT. On our 48-th (60s exposure) set we found 1 optical transient within Swift error-box (ra=05 12 40 dec=-07 02 57 r=0.050000) brighter then 16.7. The 5-sigma upper limit has been about 16.7mag The message may be cited. The 2-m LCOGT Faulkes Telescope North began observing Swift GRB160131A (Page et al. GCN 18951) on Jan 31 at 09:37 UT (~77 minutes after the burst trigger) with griZY filters. We clearly detect the optical afterglow (Page et al. GCN 18951; Yurkov et al. GCN 18952), with a magnitude of r=15.29 +- 0.01 at 81 minutes post GRB, as calibrated against nearby USNOB-1 star RA(J2000)=05:12:41.5 DEC(2000)=-07:03:09.81 with R2=14.28. Observations are going on. We observed GRB 160131A (Page et al. GCN 18951) with Xinglong 0.8-m TNT telescope at 10:22:09UT, about 2 hours after the burst. The optical afterglow (Page et a.., GCN 18951, YurKov et al., GCN 18952) was detected in our white, B, and R, I-band images. The brightness of the optical afterglow is about 16.1 mag at the mid time of 118 min afer the burst, calibrated by the USNO B1.0 star (RA=05:12:39.8 DEC=-7:02:02 R2=15.51mag). The message may be cited. We observed GRB 160131A (Page et al. GCN 18951) with 60cm WFT telescope at 10:29:14UT, about 127 min after the burst. The optical afterglow (Page et a.., GCN 18951, YurKov et al., GCN 18952, Guidorzi et al., GCN 18953, Xin et al., 18954) was detected in our white and R-band images. The brightness of the optical afterglow is about 15.85 mag at the mid time of 127.5 min afer the burst, calibrated by the USNO B1.0 star (RA=05:12:39.8 DEC=-7:02:02 R2=15.51mag). We observed the field of GRB 160131A (Page et al., GCN Circular 18951) with the Reionization and Transients Infrared Camera (RATIR; www.ratir.org) on the 1.5m Harold Johnson Telescope at the Observatorio Astron=F3mico Nacional on Sierra San Pedro M=E1rtir from 2016/01 31.35 to 2016/01 31.37 UTC (0.07 to 0.50 hours after the BAT trigger), obtaining a total of 0.18 hours exposure in the r, i, and z bands. The source fades roughly as t^-0.87 during our observations. This source is presumably the optical counterpart reported by Page et al. (GCN Circular 18951), Yurkov et al. (GCN Circular 18952), Guidorzi et al. (GCN Circular 18953), and Xin et al. (GCN Circular 18954). We observed the field of GRB 160131A (Page & Barthelmy, GCN 18951) using the LCOGT-1m located at the Siding Spring Observatory. Observations started at 11:50:49 UT and ended at 12:15:46 UT on 2016-01-31 (i.e., 3.505 - 3.921 hr after the BAT trigger) and a series of 150s U-/B-/V-/R-/I-band frames were obtained. calibrated with four SDSS stars in the field. M.R. Goad, J.P. Osborne, A.P. Beardmore and P.A. Evans (U. Leicester) report on behalf of the Swift-XRT team. Dec (J2000): -07d 02' 59.6"
with an uncertainty of 2.2 arcsec (radius, 90% confidence). Dec(J2000) = -07d 02' 13.0"
with an uncertainty of 1.1 arcmin, (radius, sys+stat, 90% containment). The partial coding was 64%. The mask-weighted light curves shows a small precursor starting at ~T-2 sec and the main peak is a FRED starting at ~T+10 sec, peaking at ~T+18 sec, and returning to baseline at ~T+800 sec (although there is a possibility that it goes longer but the observing window ended at T+950 sec). T90 (15-350 keV) is 325 +- 72 sec (estimated error including systematics). The time-averaged spectrum from T-1.49 to T+773.03 sec is best fit by a simple power-law model. The power law index of the time-averaged spectrum is 1.24 +- 0.05. The fluence in the 15-150 keV band is 2.04 +- 0.05 x 10^-5 erg/cm2. The 1-sec peak photon flux measured from T+15.97 sec in the 15-150 keV band is 6.4 +- 0.3 ph/cm2/sec. All the quoted errors are at the 90% confidence level. We have detected GRB 160131A optical afterglow at iTelescope observatory (Siding Spring, Australia) using T9 0.32-m f/9 RCOS telescope and T17 and T32 0.43-m f/6.8 astrographs. The observations were started at 2016-01-31 10:01:17 (UT). Several images using photometric R and V filters with 300 sec and 120 sec exposure time were taken. The afterglow was detected at the position RA 05:12:40.34 and DEC -07:02:58.3. Tmid(s)+T0    Filter     Exp. time             Mag          Mag. Err. Tmid(s)+T0    Filter      Exp. time            Mag          Mag. Err. Tmid(s)+T0    Filter      Exp. time             Mag          Mag. Err. We observed the field of GRB 160131A (Page et al., GCN 18951) with the 3.6m TNG telescope equipped with the DOLoRes camera in imaging mode. Observations started on 2016 Jan 31 at 19:52 UT and consisted of two images (120s each) obtained with the R filter. The optical afterglow (Page et al., GCN 18951; Yurkov et al. GCN 18952; Guidorzi et al. GCN 18953; Xin et al., GCN 18954, GCN 18955; Watson et al. GCN 18956; Xu et al. GCN 18957) is clearly detected. From a preliminary analysis, we estimate a magnitude of R=18.1 +/- 0.1, calibrated against the USNO-B1 catalogue. Photometry is based on nearby USNO B1.0 stars, R2 magnitude. We have analysed 10 ks of XRT data for GRB 160131A (Page et al. GCN Circ. 18951), from 60 s to 23.6 ks after the BAT trigger. The data comprise 523 s in Windowed Timing (WT) mode (the first 8 s were taken while Swift was slewing) with the remainder in Photon Counting (PC) mode. The enhanced XRT position for this burst was given by Goad et al. (GCN Circ. 18958). The late-time light curve (from T0+3.8 ks) can be modelled with a power-law decay with a decay index of alpha=1.09 (+/-0.05). A spectrum formed from the WT mode data can be fitted with an absorbed power-law with a photon spectral index	of 1.44 (+/-0.03). The best-fitting absorption column is 1.76 (+/-0.15) x 10^21 cm^-2, in excess of the Galactic value of 1.1 x 10^21 cm^-2 (Willingale et al. 2013). The PC mode spectrum has a photon index of 2.10 (+/-0.08) and a best-fitting absorption column of 2.56 (+0.31, -0.29) x 10^21 cm^-2. The counts to observed (unabsorbed) 0.3-10 keV flux conversion factor deduced from this spectrum is 3.4 x 10^-11 (5.2 x 10^-11) erg cm^-2 count^-1. If the light curve continues to decay with a power-law decay index of 1.09, the count rate at T+24 hours will be 0.053 count s^-1, corresponding to an observed (unabsorbed) 0.3-10 keV flux of 1.8 x 10^-12 (2.8 x 10^-12) erg cm^-2 s^-1. The results of the XRT-team automatic analysis are available at http://www.swift.ac.uk/xrt_products/00672236. Initially weather conditions were good, but then the fog has forbidden the observations. Following the observations reported in Melandri et al. (GCN 18961), we carried out further observations of the optical afterglow of GRB 160131A (Page et al., GCN 18951) with the 3.6m TNG telescope equipped with the DOLoRes camera in spectroscopic mode. A spectrum was acquired with the LR-B grism covering the range between 3500 and 8000 AA. The observation consisted of a single 1200 s exposure, starting on 2016 Jan 31 at 20:12 UT. A preliminary analysis of the spectrum (based on archival calibration files) shows clearly the continuum with several absorption features due to Fe II, Mg II and Mg I at a common redshift of 0.97, which we propose as the redshift of the GRB. We acknowledge support from the TNG visiting astronomer Ennio Poretti. We observed the afterglow of GRB 160131A (Page et al. GCN 18951) with the 10.4 m GTC equipped with OSIRIS. Observations consisted of 3x600s spectra with grism R1000B (covering from 3700 to 7800 AA) and 3x600s with grism R1000R (covering from 5100 to 10000 AA). The first spectrum started at 21:52 UT (13.53 hr after the GRB onset) under very bad seeing conditions (> 3"). In spite of the poor seeing we detect a strong continuum across the complete range with multiple absorption features of FeII, NiII, MnII, MgII, MgI, and CaII at a common redshift of 0.972, consistent with the value measured by Malesani et al. from TNG (GCN 18965). We observed the field of GRB 160131A (Swift trigger 672236; Page et al., GCN #18951) simultaneously in g'r'i'z'JHK with GROND (Greiner et al. 2008, PASP 120, 405) mounted at the 2.2m MPG telescope at ESO La Silla Observatory (Chile). Observations started at 0:44 UT on 2016-02-01, 16 hrs after the GRB trigger, and are continuing. They were performed at an average seeing of 1.3" and at an average airmass of 1.1.
with an uncertainty of 0.5" in each coordinate. K  = 17.1 +/- 0.1 mag. Given magnitudes are calibrated against GROND zeropoints as well as 2MASS field stars and are not corrected for the expected Galactic foreground extinction corresponding to a reddening of E_(B-V)=0.09 mag in the direction of the burst (Schlafly & Finkbeiner 2011). We observed the field of GRB 160131A (Pagani and Barthelmy, GCNC 18951) with the optical three color (g', Rc and Ic) CCD camera attached to the Murikabushi 1m telescope of Ishigakijima Astronomical Observatory. The observation started on 2016-01-31 14:06:17 UT (~5.8 h afterthe burst). We detected the previously reported afterglow (Pagani and Barthelmy, GCNC 18951; Yurkov et al., GCNC 18952; Guidorzi et al., GCNC 18953) in all the three bands. Photometric results of the OT are listed below. We used GSC2.3 catalog for flux calibration. We observed the optical afterglow of GRB 160131A (e.g., Page et al., GCN 18951; Yurkov et al., GCN 18952; Guidorzi et al., GCN 18953; Xin et al., GCN 18954) using the 2.16m telescope located at Xinglong, Heibei, China, equipped with the BFOSC camera. A 2400s spectrum was acquired with the G4+385LP grism covering the range of 3500 - 8500 AA, starting at 13:49:08 UT on 2016-01-31. The spectrum shows a continuum across the whole range, superimposed with absorption features of Mg II, Ca II H+K at a common redshift of 0.97, being consistent with measurements by Malesani et al. (GCN 18965) and de Ugarte Postigo et al. (GCN 18966). We thank the excellent support of the Xinlong 2.16m staff, in particular Meng Zhai and Junjun Jia. The Swift/UVOT began settled observations of the field of GRB 160131A 78 s after the BAT trigger (Page et al., GCN Circ. 18951). A fading source consistent with the XRT position (Beardmore et al. GCN Circ. 18159) is detected in the initial UVOT exposures. with an estimated uncertainty of 0.43 arc sec. (radius, 90% confidence). The magnitudes in the table are not corrected for the Galactic extinction due to the reddening of E(B-V) = 0.11 in the direction of the burst (Schlegel et al. 1998). Date        UT start   t-T0    Filter   Exp. OT     Err. We observed the afterglow of GRB 160131A (Page et al. GCN 18951) from the 1.5m telescope (T150), at Sierra Nevada Observatory (Granada, Spain) in two epochs on the first and second night after the GRB. In the first epoch we performed observations in the V, R and I filters and the object is well detected in all bands. During these observations on January 31.807 (10.8 hr after the burst), the object has a magnitude of R=17.90+/-0.02 (Vega), using as reference star the same USNO-B1.0 object mentioned in the circular by Xin et al. (GCN 18954). On the second night we performed photometry in 5 bands, U, B, V, R and I, the object is again detected in all bands. In an image with mean epoch February 1.835 (35.5 hr after the burst) we detect the object at R=19.83+/-0.03. The long-duration, extremely hard-spectrum GRB 160131A (Swift-BAT trigger #672236: Page & Barthelmy, GCN 18951; Cummings et al., GCN 18959) triggered Konus-Wind at T0=30044.577 s UT (08:20:44.577). The burst light curve shows a single, FRED-like pulse with a total duration (80-1400 keV) of ~200 s. In the softest KW energy band the emission can be traced up to ~300 s. The emission is seen up to ~15 MeV. As observed by Konus-Wind, the burst had a fluence of 3.26(-0.32,+0.31)x10^-4 erg/cm2, and a 64-ms peak energy flux, measured from T0+2.704 s, of 2.23(-0.46,+0.46)x10^-5 erg/cm2/s (both in the 20 keV - 10 MeV energy range). The time-integrated spectrum of the burst (measured from T0 to T0+162.048 s) is best fit in the 20 keV - 15 MeV range by the GRB (Band) model with the following parameters: the low-energy photon index alpha = -0.97(-0.15,+0.24), the high energy photon index beta = -1.56(-0.10,+0.07), the peak energy Ep = 586(-259,+518) keV, chi2 = 98/97 dof. The spectrum near the peak count rate (measured from T0+0.256 to T0+14.592 s) is best fit in the 20 keV - 15 MeV range by the GRB (Band) model with the following parameters: the low-energy photon index alpha = -0.94(-0.18,+0.13), the high energy photon index beta = -1.56(-0.56,+0.06), the peak energy Ep = 1152(-438,+3060) keV, chi2 = 135/97 dof. Assuming the redshift z=0.972 (Malesani et al., GCN 18965; de Ugarte Postigo, Thoene & Sanchez-Ramirez, GCN 18966; Xu, Xin & Wang, GCN 18969) and a standard cosmology model with H_0 = 70 km/s/Mpc, Omega_M = 0.27, and Omega_Lambda = 0.73, we estimate the following rest-frame parameters: the isotropic energy release E_iso is ~8.3x10^53 erg, the peak luminosity L_iso is ~1.1x10^53 erg/s, and the rest-frame peak energy of the time-integrated spectrum, Ep,i, is ~1150 keV. All the quoted errors are at the 90% confidence level. All the quoted values are preliminary. We conduced millimetre observations of GRB160131A (Page et al., GCN 18951) with the NOrthern Extended Millimeter Array (NOEMA; Plateau de Bure, France) at 93 and 150 GHz. Observations started at 17:05 UT on February 1 (i.e. 1.36 days after the burst). We clearly detect the afterglow at both frequencies. A preliminary analysis of the 93 GHz data reveals a flux density of 1.94 +/- 0.07 mJy. Further observations are scheduled. We encourage follow-up observations at all frequencies. consistent with the enhanced Swift/XRT position (Goad et al. ; GCN 18958) and the optical position (Page & Barthelmy. ; GCN 18951, Yurkov et al. ; GCN 18952). Follow-up observations are planned. We thank the VLA staff for rapidly scheduling these observations." Thanks to Frank Marshall for pointing out the error." We observed the field of GRB 160131A (Page, et al., GCN 18951) with the Reionization and Transients Infrared Camera (RATIR; www.ratir.org) on the 1.5m Harold Johnson Telescope at the Observatorio Astron=F3mico Nacional on Sierra San Pedro M=E1rtir from 2016/02 4.10 to 2016/02 4.36 UTC (89.96 to 96.25 hours after the BAT trigger), obtaining a total of 4.60 hours exposure in the r, i, and z bands. These magnitudes are in the AB system and are not corrected for Galactic extinction in the direction of the GRB. We note that there is a faint, possible source present in the DSS near this source which could be the GRB host galaxy. Date        UT start   t-T0    Filter  Exp. OT     Err. We carried out the Giant Metrewave Radio Telescope (GMRT) observations of GRB 160131A (GCN Circ. 18951) at 1280 and 610 MHz band on 2016 Feb 09.61 UT. The data is badly affected by RFI and hence we could not obtain the expected rms. The 3-sigma upper limit on the GRB flux in the Swift error cicle (GCN Circ. 18970) are 570 and 382 uJy in 1280 and 610 MHz bands, respectively. The GMRT data for GRB 160131A is public for anyone to use. Further observations are planned. We thank GMRT staff for making these observations possible. We reobserved GRB 160131A (GCN Circ. 18951) with the Giant Metrewave Radio Telescope (GMRT) at 1420 MHz band on 2016 Feb 10.78 UT. While we do not detect the GRB radio afterglow, we place very constraining 3-sigma upper limit on the GRB flux in the Swift error cicle (GCN Circ. 18970) to be 105 uJy. Astrosat CZT Imager detected GRB 160131A (Page and Barthelmy, GCN 18951) at an incident angle of 63 degrees from the telescope pointing axis. The T90 was measured to be 106 s and 97 s in 30 - 100 keV and 100 - 300 keV respectively. CZTI being sensitive to polarimetry [Chattopadhyay et al, 2014, EXPA, Vadawale et al 2015, A&A], we have analysed the double events due to Compton scattering and detect a clear azimuthal modulation of 0.30 +/- 0.12 %, with a detection significance of 2.5 sigma. Based on a preliminary mass modelling, we estimate that the source polarisation fraction lies between ~ 50 - 60 % in 100-300 keV band. A detailed mass modeling to refine this measurement and its estimated uncertainty is in progress. In an earlier event, GRB 151006A (Bhalerao et al. GCN 18422) CZT Imager data showed a marginal evidence for polarisation signal. From the higher detection confidence for this brighter GRB160131A, we estimate that CZT Imager can provide time resolved spectro-polarimetry for GRBs with fluence larger than 10^-4 erg per cm^2. 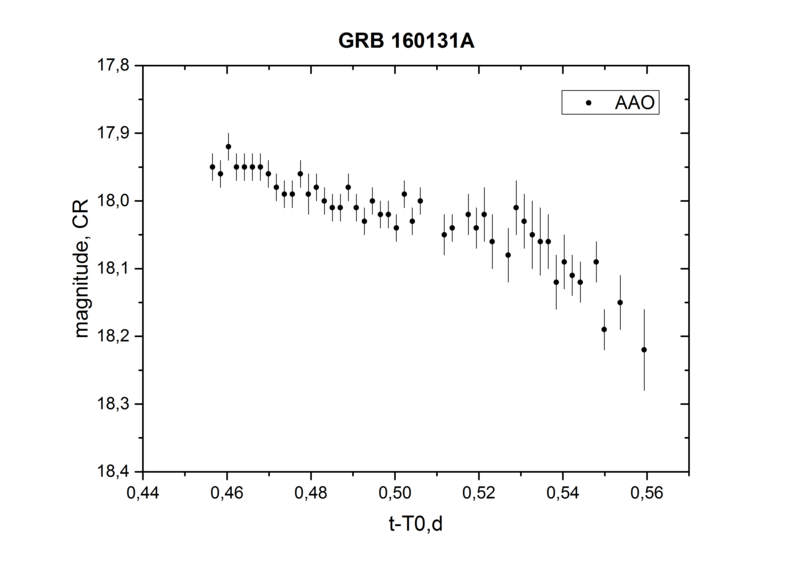 We observed the XRT position of GRB 160131A discovered by Swift (Page et al., GCN 18951; Goad et al., GCN 18958) at 15 GHz with the Arcminute Microkelvin Imager (AMI-LA) on 2016 Feb 24.79 UT and Mar 06.79 UT, corresponding to 24.5 days and 34.5 days post-burst respectively. We do not detect any radio source at the XRT location, with 3sigma upper limits of 150 uJy and 210 uJy respectively. We thank the AMI scheduling team for carrying out these observations.